In these times we are living, we have a trend happening on Metal, and it’s on the Old School genres. There are great numbers of bands doing Metal in this way, and it’s good, because the need for preservation of these genres really exists. But to play an Old School Metal genre doesn’t mean that you don’t have to be creative and have musical personality, but the opposite: you must be yourself, and can’t be another guy unless you. Want a tip of what you can do? 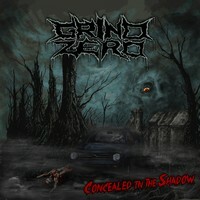 Just hear the second work from Death Metal Italian quintet GRIND ZERO, “Concealed in the Shadow”. It can be a fine example of what I mean. Of course I really can see that they are fans of DISMEMBER on the band’s earlier works, because the way they play shows it. But they put some Grindcore influences, and some touches from bands of Florida. And they show something good, besides it can lack to show something new. But the experience of hearing “Concealed in the Shadow” will make you bet more of your time on the band’s work. The album bears a sound quality that sounds as a Death Metal band from the 90s, but with the right aesthetics, the one that is used for all those who know that they are years ahead in the future. It sounds clear as well, for the rawness comes from the instrumental tunes chosen for the album. Yes, due this feature, you’ll have a good experience hearing it. If they lack originality, on the other hand they play into an energetic and different way from many clones we hear every day. Brutal pieces as “Soul Collected” (fine harsh and fast parts on the guitars), the hooking “Corrosion” (that kind of Death Metal song that charms the listener due the rhythm), the sharp harmonies of “Sodomizing the Sun” (very good grunted vocals, indeed), the nasty and slow paced “A Shadow”, and the grasping “The Horde” are proofs of a good band that has many to offer, but needs a bit more lapidating on the musical approach. For now, GROUND ZERO is really a good name, putting “Concealed in the Shadow” songs to drill into our ears.